Since its unveiling in January 2005, the Mac Mini has been the cheapest Mac that Apple sells, making it the least expensive way to get hardware that natively runs OS X. In the past, this usually meant settling for older components — especially compared to the pricier iMac and MacBook Pro lines. Although Apple has updated the Mini’s look several times since its debut — most recently in 2010 — the internal hardware often received only minor improvements. That changed in July, when the newest Mini received significant upgrades — including some serious speed enhancements — as well as an interesting subtraction or two, one of which might be a deal-breaker for some potential buyers. The new Mini is but 1.4 in. high and retains the squat 7.7-in.-square aluminum shape that arrived last year, a big improvement over the earlier white plastic/aluminum model. It weighs 2.7 lbs. and feels absolutely solid — as it should, considering that it is cut from a single block of aluminum using Apple’s patented unibody-carving techniques. It sits on a palm-sized, circular, plastic base that can be twisted open for quick access to internal components such as the RAM. 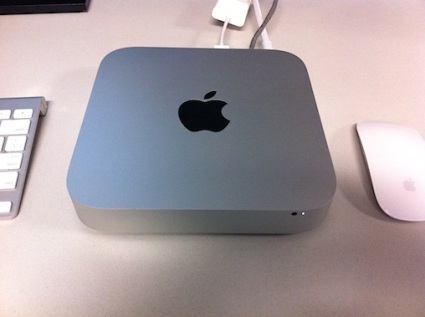 The latest Mac Mini loses the optical drive (though an external one is available from the Apple store). The Mini comes in a box that’s actually smaller than the OS X software boxes from just a few years ago. Inside that box is just the Mini, a power cord, an HDMI-to-DVI converter, two Apple stickers, a small welcome booklet and a warranty agreement. There are no software disks to lose, and, even better, no power brick to take up additional space. Low-end Minis have a dual-core 2.3GHz Intel Core i5 processor, 2GB of 1333MHz DDR3 memory (you can boost it to as much as 8GB through the Apple Store, or to as much as 16GB through third-party vendors), a 500GB 5400rpm hard drive, and an integrated Intel HD Graphics 3000 (which shares 288MB from main memory). Price: $599. For $200 more, you get a faster 2.5GHz dual-core i5 chip, 4GB of RAM, the same 500GB hard drive and a discrete graphics processor called the AMD Radeon HD 6630M, which offers 256MB of dedicated video memory. The Mini can be optioned in a variety of ways, and it’s entirely possible to customize one that will perform faster than an iMac, though the extras add up quickly. If you start with the $799 model and opt for 8GB of RAM, a Core i7 processor and a 750GB hard drive/250GB SSD drive combo, you’ll spend $1,849! For a Mini. All Minis come standard with 802.11n Wi-Fi and Bluetooth and a host of ports on the back: FireWire 800, an HDMI port (perfect for home entertainment uses), an SDXC slot, gigabit Ethernet, four USB ports, and optical/analog audio in and out. There’s also the new Thunderbolt port. Thunderbolt replaces the Mini DisplayPort used before, but since the port is the same shape, displays or adapters that worked with the old Mini DisplayPort will work with Thunderbolt. The biggest difference is what you don’t see. Thunderbolt is a new connection technology that can move a lot of data quickly (it’s 20 times faster than USB 2.0, and 12 times faster than FireWire 800, according to Apple). This is a good thing for anyone looking to squeeze the most out of this machine, particularly if you have a growing digital library and plan to use Thunderbolt-based drives for external storage. The Mini’s graphics card supports monitors via both the HDMI and Thunderbolt ports, simultaneously, for video mirroring or extended displays. And according to Macworld, the $799 Mini’s dedicated graphics card can support up to three displays — as long as you daisy-chain the monitors over Thunderbolt. There is one thing noticeably missing: an optical drive. The uninterrupted aluminum case no longer has a slot for disks to pass through. Gone is the venerable SuperDrive, capable of reading and writing to CDs and DVDs. As with the MacBook Air, Apple is attempting to create an all-digital, disc-less future. As the owner of a 2008 Mini, I was very much looking forward to testing the new model. The Mini’s attraction has always been about power per square inch as well as cost. With this value equation in mind, I requested the entry-level $599 model when Apple offered Computerworld a Mini for review purposes. I planned to use it in the living room and as a space-saving desktop. Plugging the Mini into a work environment was easy; setting it up in my living room was even easier. In either setting, you need your own keyboard, mouse and display (either a computer monitor or a TV). The living room setup required only plugging in the power and HDMI cables (with the HDMI going to my TV). Everything else was wireless: Internet access used Wi-Fi, and peripherals were connected with Bluetooth. The new Mac Mini fixes many of the gripes I had with earlier models. I still use my three-year-old Mini, but it’s been supplanted in the living room by the smaller, quieter AppleTV. The older Mini’s power brick, converters and additional wires did nothing for the decor, but it was the fan noise that finally convinced me to retire it to the office. Last year’s unibody redesign changed a few things, such as the aforementioned power brick, which is no longer required since everything is built in. The new Mini runs cool to the touch under light load; only after converting video does it ever become warm. It’s also silent: There’s no more distracting fan noise, which you’ll appreciate when sitting at your desk or on your couch. In the living room, any files that QuickTime and iTunes couldn’t play (there are a lot) were handled with ease by the free VLC. The Mini even fed sound to the surround system. (For true living-room immersion, however, you have to use third-party hardware like El Gato’s TV tuners). Even with the integrated graphics, the Mini performed well when playing movies and streaming video — no stuttering — alleviating concerns that it would suffer in comparison to more expensive Macs. Note: Since Apple killed Front Row in Lion, there’s no centralized media software built into OS X for TV use. Basically, you’ll be relying on a slew of free apps — such as VLC and iTunes — to play media files. Thankfully, both VLC and iTunes can be controlled using apps found in the App Store (VLC Remote and Apple Remote, respectively). So, be warned: using a Mini with a TV is sort of a slap-dash affair that requires different bits of software depending on what you want to do. To see how a Mac stacks up to others I’ve used, I like to export a fairly complex 50-minute video created in iMovie. (I export an iMovie file using Apple’s “Large” settings, resulting in an h.264 m4v file with a resolution of 960 by 540 pixels.) The 24-in. iMac I reviewed in 2009 rendered the movie in two hours and 15 minutes; the 21.5-in. 3.06GHz iMac released last year rendered the movie in one hour and 49 minutes. This Mini was able to render the project in one hour, thirty-three minutes and twenty-six seconds — a nice reminder that under the hood lives Intel’s Core i5. It is quite the capable little chip. The loss of the optical drive means you’ll be more dependent on the Mac App Store for software. One reason the iPhone and iPad have been so compelling is the App Store, which Apple earlier this year rolled out for the Mac. Old news? Maybe. Big deal? Definitely. The Mac App Store is one of the biggest reasons Apple was able to kill off the optical drive, though OS X lets you wirelessly access a DVD or CD drive on another computer if you need to. (The option for doing so is under the Sharing system preference.) Or you can buy an external SuperDrive for $79. It plugs right in to one of the USB ports. If you require constant access to an optical drive and don’t want to buy an external unit, this Mac Mini is not for you. If you’re not really using optical disks any more, the DVD/CD Sharing feature will get you by in a pinch. I mentioned earlier that the ports are all located at the rear of the machine, so as not to break up the aluminum design. That’s probably not much of a problem if the Mini is within reach on your desk, but it could be an issue in some living room setups. I’m sure there will be comments about how you can build your own, cheaper media/work PC (which is possible), but for those interested in purchasing a Mac, this Mini is the least expensive option. It makes a great living room machine for anyone looking for a full Mac OS X experience on their TV, and it fits in just fine in the office if you’re looking for an inexpensive Mac. Recommended. Express IT: iPhone 5 rumours - sound or silly?